Andrews McMeel Publishing, 9780740780110, 32pp. Remember when A was for apple? Well, now (sigh) A is for aging. 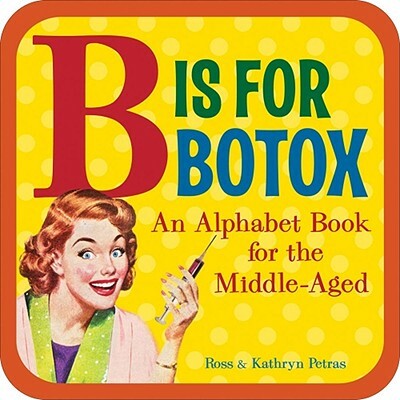 The A, B, Cs of adulthood differ ever so slightly from the popular grade school primers of the past inside Ross and Kathryn Petras's B Is for Botox: An Alphabet Book for the Middle-Aged. This hilarious board book has a fun, retro look and makes a unique gift for grown-ups who don't necessarily want to grow up. Dripping with sarcasm, each letter will remind you that while you still have your sense of humor, jokes about aging seem to ring a little truer than they used to! Arnold sees his favorite childhood toy, the Atomic Astro-Rocket, on Antiques Roadshow. It is officially an antique! "Hmm," thinks Arnold. "Does this mean that now that I'm middle-aged, I'm officially an antique?" Hmm. . . What do you think? Ross and Kathryn Petras are the authors of numerous best-selling humor books and have received coverage in a vast array of media, including the "New York Times Book Review, People, Reader's Digest," the "Wall Street Journal," and more. Ross lives in New Jersey and Kathryn calls Manhattan, New York, home.